The specter of death haunted Schubert during his entire life: interspersed among his creations of sublime peace are often eerie and foreboding references to fate and demise. Schubertiade III presents two potent pairings of instrumental works and songs. Gilles Vonsattel’s penetrating interpretation of the urgent, tempestuous Piano Sonata in c minor is preceded by Der Jüngling und der Tod, and the second half is highlighted by the Escher String Quartet’s visceral performance of Schubert’s “Death and the Maiden” Quartet, accompanied by Schubert’s song of the same name sung by baritone Nikolay Borchev. 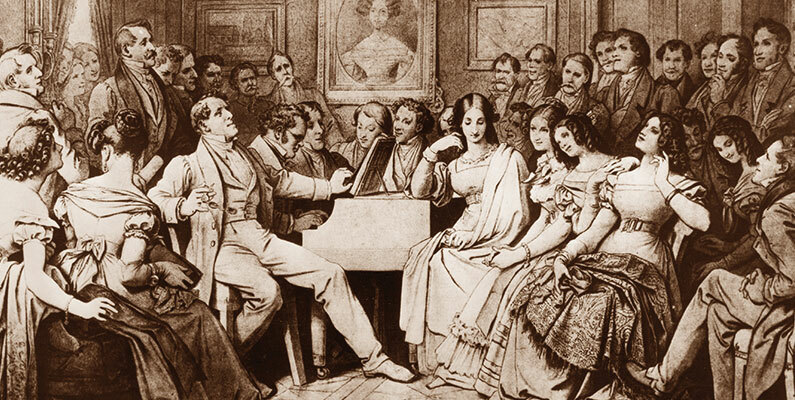 Schubertiades, which originated during Schubert’s life, were social gatherings in private residences that included readings, dancing, dining, and the music of Schubert. They were often hosted by the members of the “Schubert circle,” his close friends and admirers, who simply could not get enough of Schubert’s music and were eager to hear his latest magical creations. Schubert biographer and Music@Menlo Encounter Leader Christopher H. Gibbs has described Schubertiades as “…certainly events, but also, perhaps, a state of mind.” Music@Menlo’s Schubertiades—immersions in the composer’s art—revive the concert tradition that entranced Schubert’s most loyal audiences. In the social tradition of the original Schubertiades, enjoy an intermission reception with the musicians.